What’s Up With the Rainforest: Will Turning Vegetarian Save the Planet? With the catastrophic earthquakes in Haiti and now Chile occurring within two months of each other, we can’t help but be reminded just how powerful mother nature can be, possessing the ability to change our entire way of life in an instant. In the wake of such tragedies, the simple fact remains, there are many things in this world that we don’t have the ability to change, predict or stop from happening. We must also realize the countless opportunities we are given each day to make what we can do count for something. This week the Rainforest Newsladder has reflected this notion by highlighting the ways in which some individuals, groups, and countries are seizing the moment and taking advantage of the power they do have. Along with our partner Rainforest Alliance, we encourage you become an active part of the movement. More of us are becoming conscious of how the decisions we make in our daily lives have a much broader impact on the global community, as evident through our first group of stories that ask, “Will turning vegetarian save the planet?” Of course this wouldn’t solve all our problems, but studies show that livestock agriculture produces more greenhouse gas emissions than every train, truck, car and aeroplane put together. Our food habits do have an immense impact on the earth and simply shifting towards a more vegetarian diet will unfold many benefits for the environment. Taking notice, are university campuses across the nation who are participating in the campaign “Meatless Monday” to pledge their support for an increased ecological sustainability. UCSB has recently joined the movement, agreeing to one day a week, removing all meat from one of the dining commons, and beef from the remaining three. So even if you’re a dire hard meat lover, cutting out the red stuff for one day, viewing meat as more of a luxury, rather than a staple, and choosing local, sustainably produced meat will make a difference. Even decisions as small as selecting that perfect bottle of wine to go with your dinner provides an opportunity to make an eco-friendly choice. Patrick Spencer, director of Cork ReHarvest, explains how cork is ‘green’ – helping to sustain forests, preserve biodiversity, and is recyclable. So the next time you reach for a bottle, make sure you pay attention to the top as much as you do to the name on the label and chose one with cork, not aluminum or plastic screwcaps. 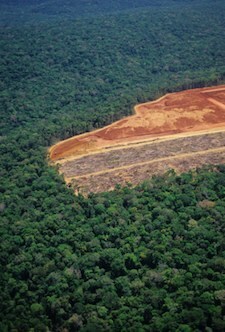 As we have discussed before, deforestation has been detrimental to rainforests and our environment. But this week we have seen cooperation between various countries working towards creating sustainable land practices, as a group of eleven tropical rainforest countries, dubbed as F-11, have pledged to make a commitment to sustainable forest management. Indonesia and Australia have also come together, launching a $27 million project to help fight deforestation in Sumatra, hoping to help curb greenhouse gas emissions and boost a UN-backed forest-carbon trading scheme. It is important that we each make an effort towards a healthier planet, and that starts by becoming informed on what kind of choices you can make that will help solve this crisis. So begin by checking out the Rainforest Newsladder to discover what is going on all over the world, and then post your own stories to make sure the important issues of today are being talked about. You can also continue the conversation and connect with other concerned citizens on our Facebook page.